"The unveiling of the bronze statue in the Vatican gardens turned into a consecration of the whole Vatican State to St Joseph and St Michael, the patron saints already chosen by the Governor. And so Francesco and Benedict have once again entrusted the capable care of the State to the foster father of Jesus and the Archangel, constantly fighting the devil along the way through poverty and generosity, devotion and opportunism, evangelical enthusiasm and corruption that live beyond the Leonine Walls. "Complaining and ranting is their forte. They grumble, moan and criticise . They are in a bad mood and, what is worse, they bear grudges "(Charles Peguy)." The great work is by Giuseppe Antonio Lomuscio b.1955, a very distinguished and gifted Italian artist who has been commissioned for many works of religious art. He said that the work “reflects a conception of art as a reflection of the beauty with which God has filled creation, and in particular, the creature that he created in his image and likeness, the human creature, the closest in the scale of beings to the splendour of the angelic creatures”. 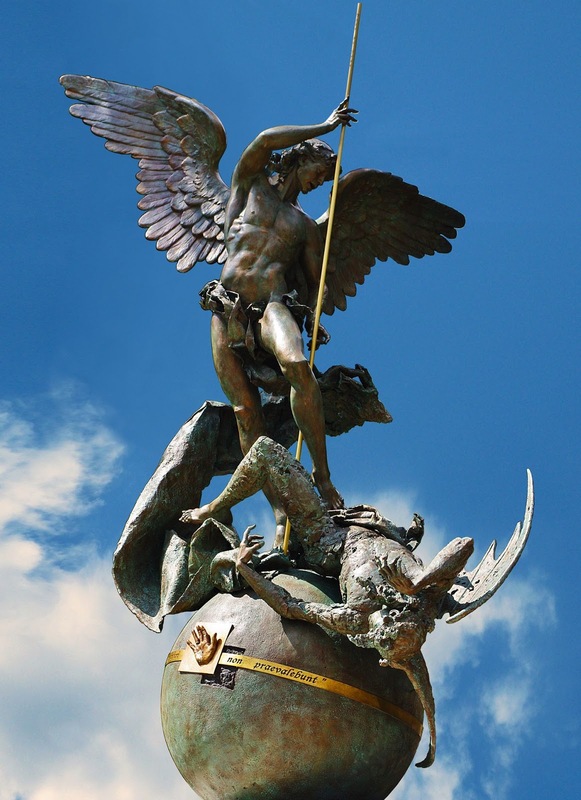 This is why, he added, Michael the Archangel is “shown here with the heroic traits of the human figure, while Satan, whom he defeated, is represented with a figure of the same shape, but altered and disfigured, as a consequence of sin”. "[H]ow much the figure of the Archangel Michael, the protagonist in many pages of the Old and New Testaments, is felt and invoked by the people and how much need the Church has of his heavenly protection: of him, who is presented in the Bible as the great warrior against the Dragon, the leader of the demons. “Now war arose in heaven, Michael and his angels fighting against the dragon; and the dragon and his angels fought, but they were defeated and there was no longer any place for them in heaven. And the great dragon was thrown down, that ancient serpent, who is called the Devil and Satan, the deceiver of the whole world—he was thrown down to the earth, and his angels were thrown down with him” (Rev 12:7-9). With this dramatic description, the sacred author presents us with the fall of the first angel, who was seduced by the ambition to become “like God”. Whence the reaction of the Archangel Michael, whose Hebrew name “Who is like God?”, affirms the uniqueness of God and his inviolability. As fragmentary as it is, the evidence of Revelation concerning the personality and the role of St Michael is very eloquent. He is the Archangel (cf. Jude 1:9) who affirms the inalienable rights of God. He is one of the princes of heaven (cf. Dan 12:1)—charged with guarding the Chosen People—from whom the Saviour will come. Now the new People of God is the Church. That is the reason she considers him her protector and support in all her struggles for the defence and expansion of the kingdom of God on earth. It is true that “the powers of death shall not prevail”, as the Lord assured (Mt 16:18), but this does not mean that we are exempt from trials and battles against the snares of the evil one. In this struggle the Archangel Michael stands alongside the Church to defend her against all the iniquities of the age, to help believers to resist the devil, who “prowls around like a roaring lion, seeking some one to devour” (1 Petr 5:8)." "It was customary in the Middle Ages to consecrate the summits of hills and mountains to Michael, the archangel, from an association of ideas which needs no explanation. Similarly, in classical times, the Alpine passes had been placed under the protection of Jupiter the Thunderer, and lofty peaks crowned with his temples. Without citing the examples of Mont Saint Michel on the coast of Normandy, or of Monte Gargano on the coast of Apulia, we need only look around the neighborhood of Rome to find the figure of the angel wherever a solitary hill or a commanding ruin suggested the idea or the sensation of height. Deus in altis habitat. Here is the isolated cone of Castel Giubileo on the Via Salaria (a fortified outpost of Fidenae); there the mountain of S. Angelo above Nomentum, and the convent of S. Michele on the peak of Corniculum. The highest point within the walls of Rome, now occupied by the Villa Aurelia (Heyland) was covered likewise by a church named S. Angelo in Janiculo. The two principal ruins in the valley of the Tiber -- the Mausoleum of Augustus and that of Hadrian -- were also shaded by the angel's wings. The shrine over the vault of the Julian emperors was called S. Angelo de Augusto, while that built by Boniface IV. (608-615) above Hadrian's tomb was called inter nubes (among the clouds), or inter coelos (in the heavens). This shrine was replaced later by the figure of an angel. During the pestilence of 1348 the statue was reported by thirty witnesses to have bowed to the image of the Virgin which the panic-stricken people were carrying from the church of Ara Coeli to S. Peter's. In 1378 the ungrateful crowd destroyed it in their attempt to storm the castle. Nicholas V. (1447-1455) placed a new image on the top of the monument, which perished in the explosion of the powder-magazine in 1497. The shock was so violent that pieces of the statue were found beyond S. Maria Maggiore, a distance of a mile and a half. Alexander VI., Borgia, set up a statue for the third time, which was stolen by the hordes of Charles V. for the sake of its heavy gilding. The marble effigy by Raffaele di Montelupo was placed on the vacant base, and remained until Benedict XIV. (1740-1758) set up a fifth and last figure, which was cast in bronze by Wenschefeld." Yet after the Second Vatican Council, if you believed in angels you were scoffed at. "Medieval", "Popular", "Simple", "Crude and shallow faith" were some of the descriptions. In North America in particular in the `80s and `90s this fitted in with the dismissal of Blessed John Paul II as being "of a medieval mindset" and from "an embattled and backward looking Polish Church"
In attempting to purify the faith by subtracting from the corpus of doctrine, they forgot that it is the entire corpus of doctrinal faith which has the "power to assimilate everything that it meets in the various settings in which it becomes present and in the diverse cultures which it encounters, purifying all things and bringing them to their finest expression." "Faith is also one because it is directed to the one Lord, to the life of Jesus, to the concrete history which he shares with us. Saint Irenaeus of Lyons made this clear in his struggle against Gnosticism. The Gnostics held that there are two kinds of faith: a crude, imperfect faith suited to the masses, which remained at the level of Jesus’ flesh and the contemplation of his mysteries; and a deeper, perfect faith reserved to a small circle of initiates who were intellectually capable of rising above the flesh of Jesus towards the mysteries of the unknown divinity. In opposition to this claim, which even today exerts a certain attraction and has its followers, Saint Irenaeus insisted that there is but one faith, for it is grounded in the concrete event of the incarnation and can never transcend the flesh and history of Christ, inasmuch as God willed to reveal himself fully in that flesh. For this reason, he says, there is no difference in the faith of "those able to discourse of it at length" and "those who speak but little", between the greater and the less: the first cannot increase the faith, nor the second diminish it"